What’s really cool about these little plates is that they all hinge together to build incredible forts. What’s awesome about them is that when you shoot them, it’s really visible! 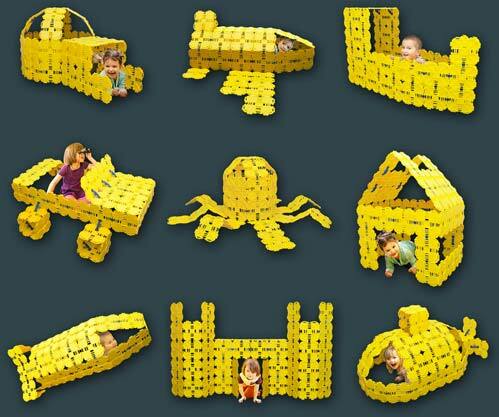 Build yourself some forts! They’re excellent targets. Super fun to assemble. You can kind of assemble it however you’d like. If you want a target in a particular form, you can build it that way. They’re super fun toys. Built to withstand extreme play and can be assembled into endless configurations. Kids can build bunkers, tunnels and battle armor with spinning targets... the real payoff is seeing kids enjoying the toy. Creative building toys that let kids build forts, houses, cars, planes, and sea creatures--anything as big as their imaginations.…the toy will be high on many parent's holiday shopping lists this year. No doubt Blaster Boards will bring a whole new component to Nerf battles, and water gun, snowball, rubber band fights and more. These are really, really cool. It would be very easy to build something that I could fit in (at 6 ft plus). I can’t wait to take them to a [Nerf] war; I think they’d be really fun to build mobile cover. Kids can quickly build a bunker or barrier that will add fun and strategy elements to their next game of Capture the Flag, Humans vs. Zombies, or Siege the Fort. The blaster board targets make for good objective and target shooting game play, while you also have the added benefit of a construction and fort building kit to add just a little more panache to your battlefield, whether indoor or out. My kids 11 and 7 have put there iPads down to build and play nerf wars. All the kids in the neighborhood and family want to come over to play nerf wars. These are made to last, as in they aren't flimsy plastic and the targets spin freely and are strong to last as well. You won't be disappointed as this investment into fun will last a long time. Easy to set set up in many different ways and easy to take down. We love them! My son adores these. Lots of imaginative play. My 11 yr old son, his 8 yr old sister & 12 year old buddy haven't stopped playing with the set. My son is a builder. He loves to build and he loves forts. He even built himself a chair with the boards and they are strong enough to hold him. These are durable, easy for kids to figure out on their own, and won’t be ruined when they forget to bring them in for the night. We will be buying more! Simply put? The best Nerf accessory.